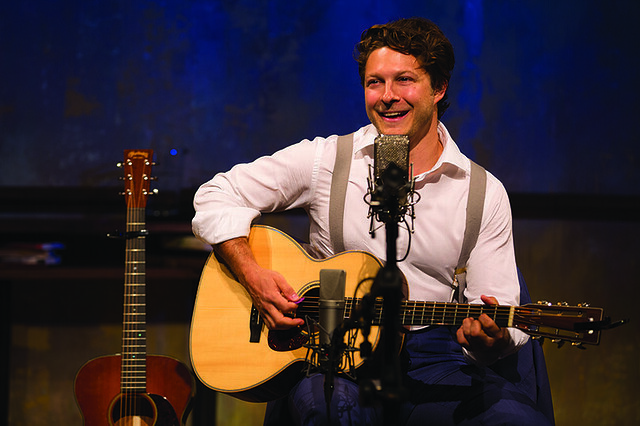 Benjamin Scheuer in The Lion, at Arena Stage through April 10th. Photo by Matthew Murphy. 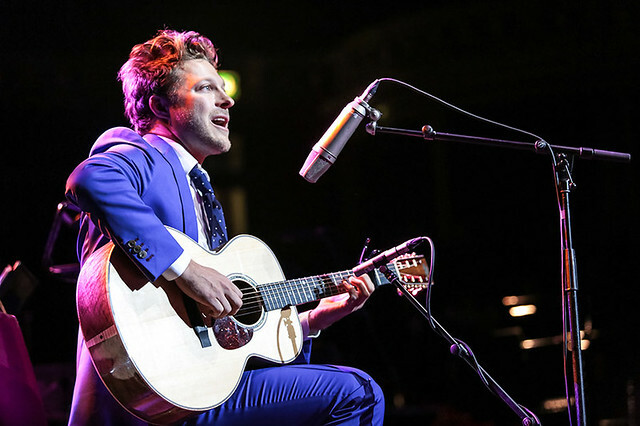 From the moment Benjamin ScheuerÂ walks onto the stage, there is something assuringÂ about his presence. His smile is broad, his demeanor is warm, and there is a certain level of comfort in his tone. He’s in character as himself, and it’s a role that suits him well. As he takes his place among the seven guitars that will help him tell his story over the next 70 minutes,Â you are immediately invited into a very intimate space in his life – one that he shares with the ease of someone more akinÂ toÂ a closeÂ friend sitting across a table than a relative stranger in a darkened theater. But Scheuer – the writer and performer behindÂ The Lion,Â which is currently at Arena Stage – presents himself with such stark honesty and openness that it’s clear he won’t be a stranger to any audience for long. Though he starts off with a charming song about the fond memories he has of playing music with his father as a child on a home made banjo, Scheuer quickly heads to heavier territory. He longs to play guitar the way his dad does – a notion that unexplainably angers his father and drives Scheuer to pursue his love of music on his own. With such distinctly different personalities, a deep disconnect eventually grows between the two of them until the songs they used to playÂ together are replaced with silence. As he gets older, the struggle to find common groundÂ with the man he simultaneously admired and resented leaves Scheuer without much of a relationship with anyone in his family, and he putsÂ it all behind him to strike out and follow his own voice, and find a way of playing solo. Benjamin Scheuer in “The Lion,” at Arena Stage through April 10th. Photo by Matthew Murphy. As with any truly captivating story, there is love and there is heartbreak, there is loneliness and there is self-doubt, and there is the relentless journey towards understanding who on earth you are and where on earth you belong. Scheuer crafts these tales with the kind of thoughtful dialogue that reveals his natural abilities as a storyteller, and as he works his way through some very serious highs and lows, his fingers fly over the chords he plays, punctuating every emotion with a sound that fittingly emulates it. When life presents him with a crushing roadblock and he has to lean on the family he’d written off, Scheuer doesn’t shy away from the reality of hitting rock bottom, and the vulnerability with which he recounts overcoming it is as beautiful as it is unnerving. TheÂ Lion has been called a coming-of-age story, but more accurately, it is the soundtrack of a life that, like so many others, bears the scars that coming-of-age dealt. Finding the courage to forgive the wrongs and embrace the rights has led Scheuer here – and given that “here” is a year-long national tour and a 2015 Drama Desk Award for Outstanding Solo Performance and a 2015 Theatre World Award, it would seem that it’s not such a bad place to be. The Lion runs at Arena Stage through April 10th. Tickets start at $40 and are available here, or by calling 202-488-3300 (fair warning: don’t snooze on getting them, as the run is nearly sold out). Arena Stage is located at 1101 Sixth St. SW. There will be a free songwriting masterclass with Benjamin Scheuer on Sunday, March 20th for amateur and professional songwriters – find out more on how to apply here.